I’ve gotten progressively ruder with my friends, who, even when just hanging out in the evening, keep their iPhones and Blackberrys in their hands. I understand the desire to check your email, stocks, Facebook wall, OKCupid or Grindr message in those moments when you simply have to walk or sit on a train or scarf some lunchtime Chipotle. 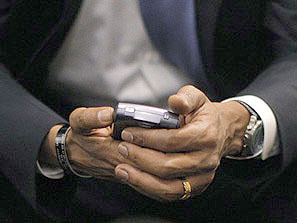 But when you are actually among people you know, the act of glancing down at your mobile device is simply bad manners. It states absolutely that your current interaction is not as important or as interesting as any number of online connections. It’s rude. And it misses the point. The point is that these devices can enhance your social life, not replace it. And yet they seem like cuckoos in our social nest. I know I’m not one to talk. I communicate directly with probably ten times the number of people online that I do by face or physical presence. (Summers in Provincetown change that ratio dramatically, thank God.) But I try not to do both at once. I feel precisely the same way. And not uncoincidentally, I think, Andrew and I are close to the same age. As near as I can remember, I have never heard this complaint from anyone under the age of 30 or so. So: is this behavior rude? Or is it rude only if you’re socializing with old fogies who consider it rude, sort of the way you watch your language around people who you know are offended by four-letter words? Or is it not even that, but simply a cultural change, like calling someone to thank them for a gift instead of writing a card, and it’s us fogies who are being rude by refusing to understand that this behavior is neither offensive nor meant to be offensive? It’s just the way teens and twenty-somethings live. There’s no answer to this, of course. I will probably go to my grave thinking it’s rude, but unlike Andrew, I long ago decided to simply live with it because it seems so obviously to be a value-neutral cultural change, not something intended to annoy people. But that’s only for the young. If you’re over 50, you don’t get that forbearance from me: for our generation, it’s just rude, full stop. When you’re socializing, turn the damn thing off.